Named after the cartoonist Gerald Scarfe (whose characterful illustrations will adorn the bar's walls), Scarfes Bar is a shining beacon in the otherwise lacking High Holborn area. 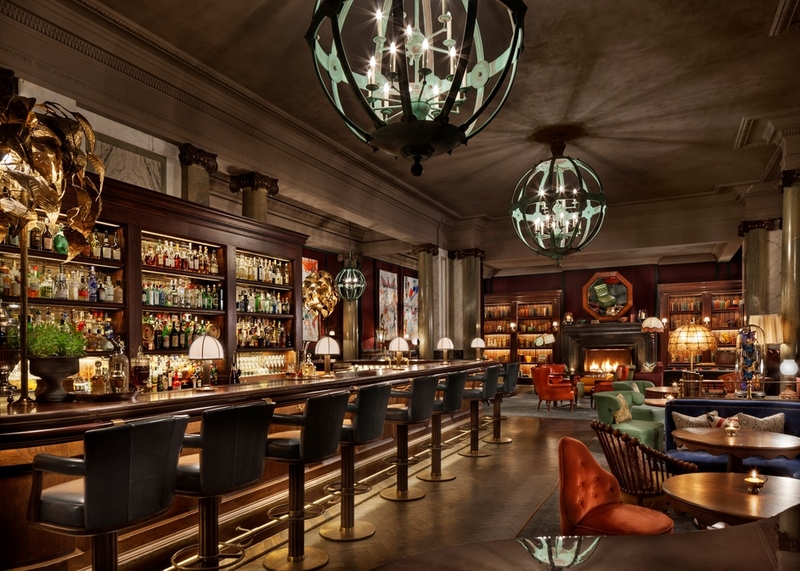 Part of the new, luxurious Rosewood London hotel, the bar is grand and stately while also being welcoming and homely. Designed by Martin Brudnizki, it has a roaring log fire, cosy velvet armchairs and bookcases stacked with antique books hand-picked by a Portobello antique dealer. At lunchtime diners can choose among a variety of cuisines, with Indian curries, European style casseroles and homemade pizzas on the menu. In the evenings, meanwhile, there's a range of bar snacks and lighter dishes such as veal and mushroom meatballs, fried lobster momo's and Bengali vegetable chops. Guests are also spoilt for choice when it comes to drinks, with the bartenders on hand to advise on beer, match wines or create one of the tempting cocktails. With its own entrance off High Holborn, the bar is open to the public as well as hotel guests. Scarfes Bar clubs, bars, cabaret nights, casinos and interesting nightlife. What are the best dining options near Scarfes Bar London? Scarfes Bar gyms, sporting activities, health & beauty and fitness. The best pubs near London Scarfes Bar. Where to have your meeting, conference, exhibition, private dining or training course near Scarfes Bar. From cheap budget places to stay to luxury 5 star hotels see our discounts for Scarfes Bar hotels, including Rosewood London from 80% off.